UPDATED: Sun., June 24, 2018, 8:24 p.m.
No one wants to make a big deal about an early-season losing streak, especially at the developmental level of the short-A Northwest League. Still, no one wants that streak to go on too long. 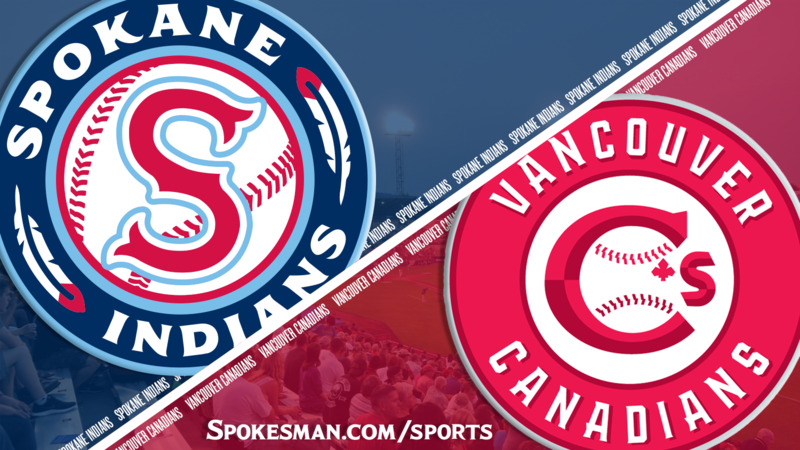 Hasuan Viera went 3 for 4 with three RBIs and the Spokane Indians edged the Vancouver Canadians 4-3 in the second game of a three-game series Sunday at Avista Stadium. The win snapped a four-game losing streak. Viera’s two-run double in the third inning proved to be the hit that kept the Indians (3-7) up the rest of the afternoon. “Thanks to the skipper for the confidence. I’m very happy to help contribute to a great win today,” Viera said through a translator. Indians starter Seth Nordlin (1-0) struck out eight over 5 2/3 innings and allowed three runs on six hits and one walk. Nordlin, a 13th round pick of Texas in the 2017 MLB Draft, was making his second start and third appearance of the year. In six previous innings he had allowed two runs (one earned) on two hits and a walk with four strikeouts. “Coming out here after a four-game losing streak and getting that done, I just want to thank my defense,” Nordlin said, before mentioning shortstop Tyler Depreta-Johnson specifically, who made several big plays in the field. Nordlin allowed a two-out line-drive double down the left-field line to Griffin Conine – son of longtime big leaguer Jeff Conine – in the first inning but also had a couple of strikeouts, getting Tanner Kirwir looking and Jake Brodt swinging. The Canadians got something going in the second. Nordlin struck out Chris Bec with a breaking ball, but walked Bryan Lizardo and gave up a hard hit single to Freddy Rodriguez. The runners moved up to second and third on a wild pitch and Lizardo scored on a sacrifice fly to center. Nordlin came back to strike out Brandon Polizzi with a breaking ball to end the inning. “It was a point of emphasis all week,” Nordlin said of the breaking ball. “The last start, I didn’t have that pitch last week. It was just my fastball and changeup. Holmberg said Nordlin brought the entire package. “The breaking ball was really good because of the mix he had,” the manager said. “Don’t discredit his fastball and changeup because he had both those going, too. The Indians weren’t down long. In the bottom half of the second, Starling Joseph hit a one-out single, went to second on an errant pick-off throw and scored on a double that just stayed fair down the right-field line by catcher Francisco Ventura. Ventura went to third on a groundout and scored on an infield single by Viera to make it 2-1. Depreta-Johnson singled and J.P. Martinez walked to load the bases with two outs. With a chance to blow it open, Jonah McReynolds ripped a liner to short that was snagged for the third out. Leading off the third inning and one pitch after getting dusted by Nordlin, Vincent Capra clubbed a homer that went over the left-field fair pole to tie it. Nordlin came back with two more strikeouts in the inning. Vancouver starter Josh Winckowski, a 15th-round pick of the Toronto Blue Jays in the 2016 draft, got into hot water of his own making in the third. With one down, he hit Diosbel Arias and Starling Joesph, then walked Juan Ventura to load the bases. Francisco Ventura struck out, but Viera came through with a double to the left-field corner to score two and put the Indians up 4-2. Vancouver got one back in the fourth. Lizardo doubled with one down, went to third on Rodriguez’ single and scored on a sacrifice fly by Owen Spiwak. Nordlin cruised through the fifth with two more strikeouts. In the sixth he gave up a leadoff ground-ball single and after an animated conversation with Holmberg, got two more outs before the manager replaced him with David Lebron. So what did Holmberg tell Nordlin? Nordlin said he wasn’t disappointed not to get through the inning. Lebron walked Lizardo but coaxed a groundout by Rodriguez to end the inning. With one down in the bottom half of the sixth, Viera popped a one-out drag bunt between the pitcher and second base for his third hit of the day but was thrown out stealing when he slid past second base. “I’ve been working on (the drag bunt) all my life and in a tight game like that I was trying to anything I can to get on base,” Viera said. Lebron gave up a couple of singles, including a routine pop-up that fell between three fielders in short center, but got out of the seventh unscathed. With one down in the bottom half, McReynolds rocked one off the wall in left-center for a double off lefty reliever Nick Allgeyer. McReynolds moved over on a fly to medium right by Aparicio but was stranded when Arias grounded back to the pitcher. Lebron had a 1-2-3 inning in the eighth and Emmanuel Clase pitched a perfect ninth for the save. Viera had a chance for a four-hit day but had a close pitch called for strike two, then looked at strike three. Published: June 24, 2018, 6:12 p.m. Updated: June 24, 2018, 8:24 p.m.